This lovely Heisey Orchid wine stem is in excellent, undamaged condition. The bowl is surrounded by an acid etch motif of upside-down orchids and big sprays of ribbons and bows. The Tyrolean stem is quite bright and elegant all attached to a clear broad foot. It stands 6 1/8" tall, and I have one more in my inventory. 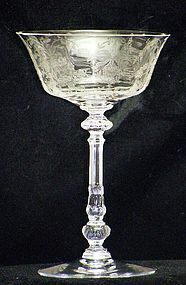 I have other Heisey and elegant glassware in my inventory ... take a peek. Insurance and confirmation is included in the price.